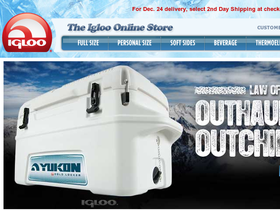 The Igloo store, online at Igloo-store.com, offers the best food and drink coolers, ice packs, and accessories. Whether you're enjoying summer fun at the beach, watching the kids' soccer game, entertaining friends at a party or enjoying a weekend of boating or fishing keep your food fresh and drinks cold with an Igloo cooler. Enjoy the best savings by visiting 58coupons for the best Igloo Store coupons, Igloo Store discounts and Igloo Store promotions. Earth coolers by Igloo are manufactured with recycled materials, shipped in 100% recycled cartons and start from $9.99. Click link and visit the store today! Enjoy this awesome cooler loaded with speakers and an amplifier ready to be used with any MP3 player. All this for only $59.99! Click link for details. Keep your food and drinks cool without the need for ice! Igloo's thermoelectric coolers plug into your vehicle cigarette lighter or other 12V outlet and are ideal for use in the car or truck while traveling. Now for only $99. Click link to shop.